With the increase use of statin drugs there has been an increased need for CoQ10 for heart health. Statin drugs interfere with your liver’s ability to create CoQ10, which then reduces CoQ10 levels in the body. There is a direct correlation with the increase use of statin drugs and an increase in congestive heart failure. This increase in congestive heart failure would make sense since CoQ10 is a necessary component for cellular energy. In a large study of older adults with heart failure issues, it was clearly noted that those with CoQ10 levels below a certain threshold were twice as likely to die when compared to those who had CoQ10 levels above that threshold. CoQ10 For Heart Health – What is it? CoQ10 is a fat-soluble, vitamin-like compound that helps convert food into energy. Specific to your heart, CoQ10 is a critical factor in its energy supply. And when your CoQ10 levels are low, it can contribute to impaired pumping of the heart muscle, which the medical community identifies as heart failure. 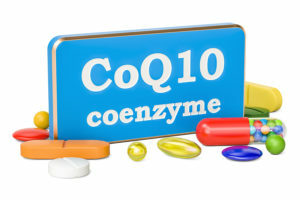 Additionally, CoQ10 is a powerful antioxidant that helps protect your cell membranes from free radical damage. Free radical damage at the cellular level leads to inflammation, which then triggers other health issues. However, the foods that typically have high levels of CoQ10 are organ meats like liver and kidneys as well as sardines, mackerel, chicken, cauliflower, broccoli and asparagus. Of those foods just listed most people would only consume chicken on any regular basis. Plus, Coq10 comes in two forms: ubiquinone and ubiquinol. Ubiquinol is the active antioxidant form of CoQ10, which is what you want. If you consume the ubiqinone form, then your body needs to convert it to the active form of ubiquinol. As we age our body becomes less efficient in this conversion process. In one study of 420 subjects, with moderate-to-severe heart failure, they were randomly assigned to one of two groups. Either a placebo or 100 mg of CoQ10 taken three times per day for two years. At the end of the study, 26% of the placebo subjects experienced an adverse cardiovascular event like a heart attack, stroke, or death. For the group taking the CoQ10 supplement, only 15% had an adverse cardiovascular event. Or a 50% reduction in their risk for a heart attack, stroke, or death. Improvement in heart contractility (squeezing motion) to increase the amount of blood pumped with each beat. Improved endothelial function, which is needed for improved vascular health. A decrease in atrial fibrillation. An increase in HDL (high density lipoprotein) cholesterol, which has been shown to reduce the potential for vascular inflammation. Reduced muscle pain caused by statin drugs. Reduced risk for a second heart attack. Seems to help lower both systolic and diastolic blood pressure. Finally, in a study done by renowned cardiologist Peter Langsjoen, MD, patients with advanced heart failure were given the ubiquinol form of CoQ10, which has a much higher absorption rate in the small intestine. Plasma blood levels showed a 4 fold increase in CoQ10, which then provided greater heart and vascular improvements. Always take your CoQ10 supplement with a meal since CoQ10 is fat-soluble. While younger people can benefit from the ubiquinone form, older adults need to use the ubiqquinol (active) form for better results. Compliance is key! Take your CoQ10 supplement each day with food because it’s extremely important to your overall heart health.